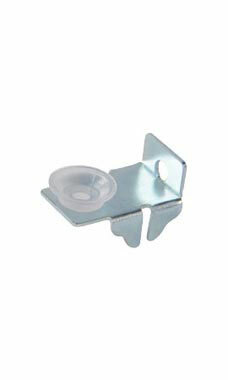 Ensure that your shelves wont slide and shift with these Glass Shelf Clips! These clips are outfitted with rubber bumpers to further protect your shelves. All you have to do is slip the clip onto the front of your shelf, the clips do the rest of the work for you! In stock and available for shipping immediately. Needed for all glass shelves to keep them stable and prevents them from rattling.